There is a saying in the Catalan language: sense foc no hi ha festa (without fire, there is no festival), and they aren’t exaggerating. Indeed, the region’s pyromaniacal bent may be the most evolved and embraced in the nation, yet flames, explosions, devils, and beasts play a role in many vaguely Christian celebrations all throughout Spain. Not surprisingly, the Spanish government recognized Wicca (a modern, pagan, earth- based practice) as an official religion in 2011; but its influence reaches well back into the 6th century, when the Iberian peninsula was taken by the Germanic tribes who drove out Roman rulers. And despite Christianity’s claim as the official religion of the ruling Visagoths, earlier pagan rituals and customs remained, especially in the countryside where citizens developed a sacred relationship with nature. Even now, despite the underlying veneration of Christian saints in most Spanish festivals, you’ll find fire, mayhem, and all manner of revelry outshining the more pious origins of celebration. In all of Spain, no fiery festivities are more famous than the effigy-burnings and massive beach bonfires of Las Fallas in Valencia. Officially held in honor of Saint Joseph, the tradition of Las Fallas began in the late 15th century and is tied indisputably to the Spring Equinox—the date in which night and day are the same length. In celebration of warmer weather to come, the people of the Valencian community cut loose with explosions, drums, and processions of elaborate figures with impressive detail and towering proportions; with some of these characters (known as ninots) reach 30 meters in height, they are truly a sight to see. Despite all the artisanal craftsmanship that goes into creating these huge wooden floats, the party culminates in torching the figures, many of which represent real people from the community. Known as one of the wildest parties in the country, the energy and spectacle of Las Fallas is burned into the memory of all those who attend, including this author. 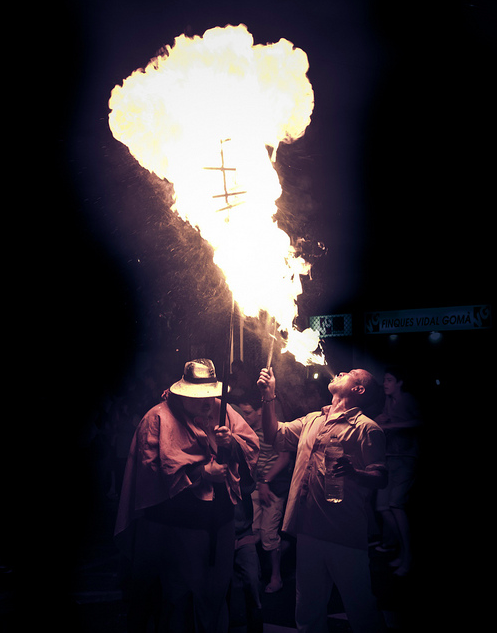 Another immensely popular and nerve-racking holiday of fire is the Night of Saint John. Celebrated all around the world, June 24th is the generally recognized birthday of Saint John the Baptist. Though the 24th is considered a holiday in many countries, it is on the 23rd—Saint John’s Eve—that the cities and towns of Spain burst into flames. 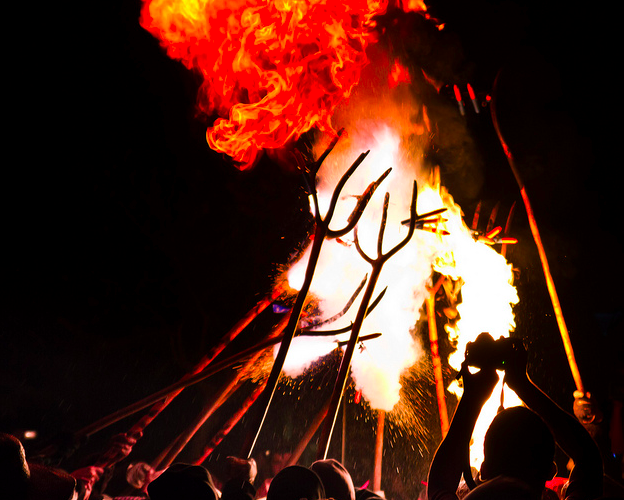 Especially in Catalunya, Galicia, and the Basque country, bonfires and fireworks are ignited to celebrate not the birth of venerable San Juan, but a day of even great pagan importance: the Summer Solstice. On the longest day of the year, the streets of Barcelona have already been sparked with spontaneous explosions for nearly a week, as local children stock up on potent firecrackers in preparation for the big night, or the “Víspera”. Children are quite literally encouraged by their parents and guardians to play with explosives that are illegal in many parts of the United States, and run uninhibited through the narrow streets of the city hurling short-fused petardos under cars, onto balconies, and into crowds! In the days leading up to the Eve of Saint John, as children’s stockpile of explosives grows, many as too eager to wait and begin setting them off all across the city. After three days, everyone walks around Barcelona on edge, as if at any given moment, a deafening boom and shower of sparks could explode around any corner, with a mischievous grin in the background. In the week before Sant Joan, little temporary stands selling all sorts of pyrotechnic goodies pop up around Barcelona, undoubtedly making a killing off of passing parents pressured by their fire-hungry little devils. This mischief of Sant Joan is all in good fun, so adults also yearn to get in on the action. For one night, adults are allowed to pretend that they don’t know any better and toss little bombs into the interior courtyards of their apartment block while getting festively drunk, all the while hoping not to blow off a pinky finger. 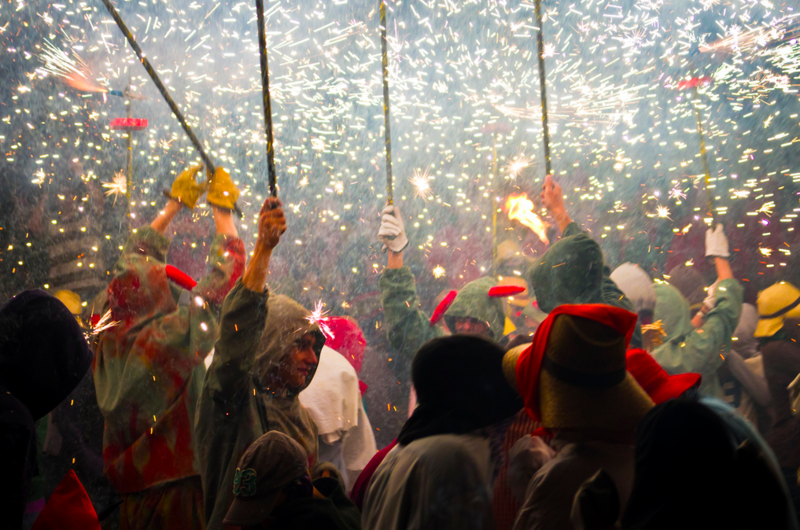 On the Nit de Sant Joan, revelers drink Cava, eat the sweet “coca de sant joan” flatbreads, wave sparklers, leap over fires, and dance below the shower of sparks erupting from the demonic and titillating correfocs. Literally translated as a “fire run” and first used in 1979 during the Festa de la Mercè (Barcelona’s festival for their patron saint The Virgin of Mercy, known for having the largest and most impressive fire spectacles of the year—a must-see if in Barcelona the third week of September), the Catalan correfocs are apocalyptic processions of demons, devils, and beasts spouting fire and pepper with explosions. Local neighborhood groups participate in this much loved and very loud tradition. Dressed in devil costumes made of heavy, flame-retardant leather and fabric, these groups (colles) make their way through the neighborhood to the sound of energetic drum corps of local youth. One by one, over and over, they light explosives mounted on long rods with swiveling heads that quickly burst into shrieking canopies of sparks as they themselves dance and spin just feet from the cowering crowd. Hats, glasses, and non-flammable cotton is recommended by the city government, as sensible course of action to take, as those with burned hair and many ruined t-shirts can attest . As an extra precaution, a quick jump into the shower fully clothed before the correfoc will be sure to keep the sparks away. The spectacle of demons and devils can be tied philosophically to the noble, Christian fight between good and evil. However, modern correfocs which feature fire-shooting floats of dragons, bulls, lizards, chicken, goats, wild dogs, and more, and the sheer glee of fire-happy, beer guzzling, participants making sure that the entire city is awake and listening to their antics, make the religious undertones of the typical Festa Major harder to identify; yet, one could safely argue, more Pagan than Christian. In Barcelona in 2013, during the Festa Major de Gràcia (the most anticipated neighborhood party of the summer), sparks from flares mounted to the snout of a giant metal dragon jumped through a street-facing window on the Carrer Gran de Gràcia and set a bedroom on fire. Firefighters broke through the door of the building and proceeded to toss a flaming mattress out onto the street from the second floor window, and as a crowd of hundreds looked on, my mild concern was overshadowed by my admiration for a culture that values celebration and tradition over basic fire safety. By the time the mattress was extinguished, the correfoc had proceeded even further into the increasingly narrow streets of the Gràcia neighborhood. Surely more than a few spectators rushed home to close their bedroom windows, and possibly use the toilet, before coming back down to the street to enjoy the party. Another slightly-twisted (in this author’s opinion) but quite popular Spanish fire tradition is that of the toro embolado. At the risk of oversimplifying a beloved local celebration, the toro embolado is a bull with balls of flammable material affixed to its horns which are set on fire before releasing the animal to roam the streets of that city or town freely, charging at will and giving local men an excuse for a public display of bravado. This risky ritual supposedly dates back to 228 B.C when an out-numbered Iberian tribe in the town of Elche, Alicante used steers with flaming horns to instill fear into the approaching Carthaginian army, thus winning the battle. Considered by some to be cruel, the toro embolado is still legal in nearly all of Spain, even in Catalunya where traditional bullfights are now banned. On occasion, a citizen is gored by this terrified animal as it charges through the streets, giving rise to the fleeting thought that maybe giving an already angry bull flaming horns might not be the best idea! 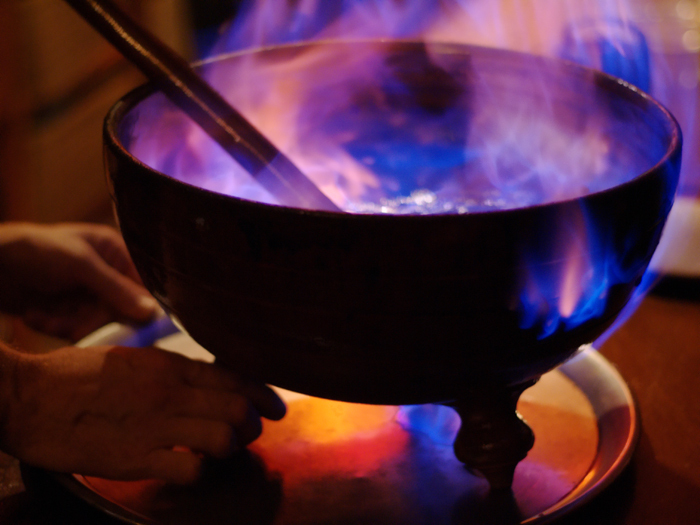 Last but not least, in this far from exhaustive list of Spanish flirtations with fire, is the sweet, potent, and mysterious elixir that is the Queimada of Galicia. Though romanticized as an ancient Celtic druid ritual of mystical origins, in reality, this tradition of setting a clay caldron of aguardiente (orujo) and sugar alight while reciting the conxuro (incantation) is quite a recent addition to popular Gallego culture. The act of burning the neutral grape brandy that is so popular in Spain’s Northwest region cannot date back to the era of Celts for the simple fact that the art of distillation and sugar cane first arrived in the Iberian peninsula with the Moors, many centuries later. In many parts of Galicia, the Queimada is a town-wide event, with huge iron pots full of orujo slowly burning all day long until the sun begins to set and the caramelized concoction is ladled out. Even more recent, however, is the modern-day conxuro that is routinely recited by friends and family at end of their hearty meal as the blue flames swirl on the surface of this primordial punch. First penned in 1967 in Vigo, the incantation’s creator got wise and registered that text as intellectual property in 2001. While in some cultures an obsession with fire is treated with therapy, in Spain it is embraced in all its wild and fiendish glory. The culture of Spain has always been one connected to the land and ancient history, as the pagan symbolism of nearly all major celebration here can attest. If you are hard-set in your dislike of loud noises, minor burns, and satanic debauchery, maybe you should pass on the next neighborhood flame fest. However, if you’re on the fence and looking for a thrill, I say dive right in. Even for someone that isn’t pyrotechnically-inclined, the thrill of mild danger and destruction is exhilarating. If you find yourself with burned feet on the beach in Barcelona or fleeing from the flaming horns of an angry bull, don’t say I didn’t warn you. If you’re interested in having someone professionally guide you through the flames, let us know! We’re not only pyrotechnically-inclined, but we’re savvy on maneuvering through the crowds to find sweet spots for you to eat, drink and be merry!